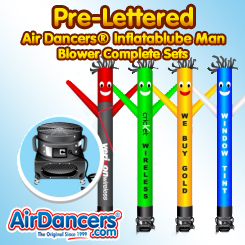 AirDancers.com is an official seller of Air Dancers® brand inflatable tube men products. 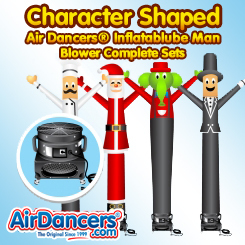 Shop the full collection of Air Dancers® inflatable tube man attachments and blower complete sets. View all the different inflatable tube men product categories; 10ft sets, 10ft tube sets, 20ft plain color sets, 20ft flag themed sets, 20ft pre-lettered sets, and 20ft character shaped sets. All Air Dancers® products are original and authentic. 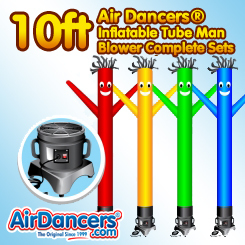 Shop our hundreds of in-stock and ready to ship Air Dancers® inflatable tube man products and in the off chance you're not finding exactly what you're looking for, you're in luck, because we can make any custom inflatable tube man or inflatable advertising product you can think of! What are you waiting for? 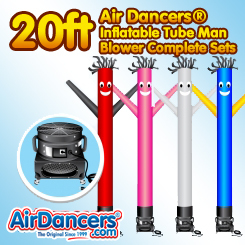 Put an Air Dancers® inflatable tube man complete set to work for your business now! These product listings are for complete sets that include the inflatable tube man attachment and the blower. Complete sets come with all the components needed to operate the project. Just open the box, attach the inflatable tube man attachment to the blower, plug the unit it, and turn it on. This product is simple, effective, efficient, and fun for everyone. 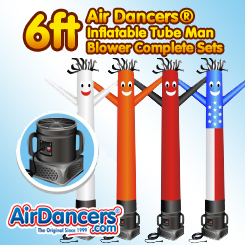 If you already have an Air Dancers® inflatable tube man blower, and you'd like to purchase additional inflatable tube man attachments, visit our attachments only page.